This topic contains 0 replies, has 1 voice, and was last updated by admin 5 months, 3 weeks ago. 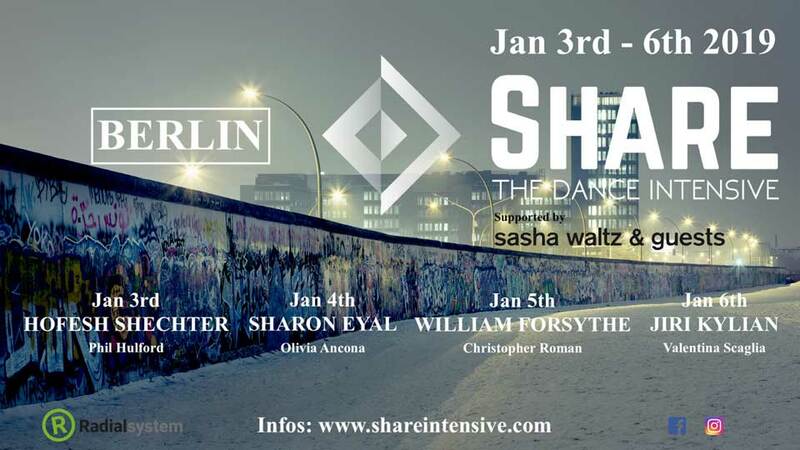 Take part of SHARE Intensive Berlin 2019 this coming winter with the support of Sasha Waltz & Guests. After our success in 2018, we are coming back to share with you the work of Hofesh Shechter, Sharon Eyal, William Forsythe and Jiri Kylian. Our collective made of dancers from Batsheva, L-E-V Sharon Eyal | Gai Behar, the Forsythe company, NDT and more, will give you time to appreciate methods and repertoire workshops from master choreographers in the beautiful dance studio at RADIALSYSTEM V.
SHARE organizes 2 sessions per day to avoid overcrowded studios. We have a limited amount of places and won’t be able to hold spots. Your payment secures your place. The intensive is exclusively made for professionals and pre-professionals with a high and advanced level in dance. Our selection process requires a video and a resume. After your confirmation email, we will send you your group assignment confirmation. SHARE gives you the opportunity to access the work of some of the best choreographers thru our collective, for an affordable fee, time, and working space, we hope you’ll enjoy it. NEXT EDITION / SHARE INTENSIVE PARIS SPECIAL BASTILLE DAY. Come and work on William Forsythe , Crystal Pite / Hofesh Shechter and Sharon Eyal works process and repertoire in the heart of Paris during beautiful July and spend the 14th of July (bastille day) in Paris. This topic was modified 5 months, 3 weeks ago by admin.